The following history is taken from accounts written by Elizabeth Kelley and an unknown author found in Diocesan archives. The Catholics of Holbrook were originally visited by the pastors of Prescott and Flagstaff, Arizona. At that time Mass was celebrated only a few times each year because of the long distances that had to be travelled by the priests without the conveniences of modern travel. The Little Colorado River near Holbrook. Navajo cornfield and hogan near Holbrook, 1889. In 1900 This parish became a mission to Winslow Arizona, and masses were celebrated more frequently. Father Thomas Connally was pastor of Winslow at the time. In 1913, the original church in Holbrook was built and dedicated to Our Lady of Guadalupe by Bishop H. Granjon of Tucson. The project was under the supervision of Father George Marx. In 1923, Holbrook became a parish, and the first resident priest, Father J.O. Barrette, arrived. The southern community of McNary was assigned as a mission. About this time, the first rectory was built, but this structure was replaced in 1951. The original church in Holbrook. 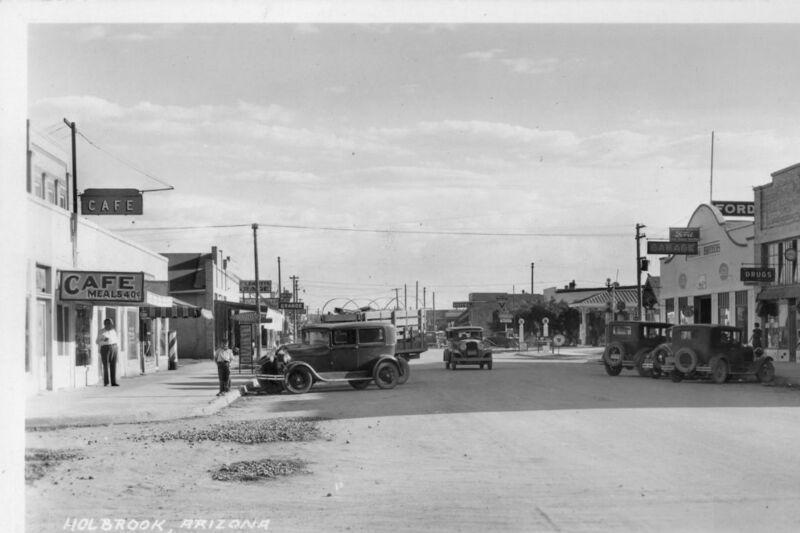 Navajo County was carved out of Apache County in 1895, and Holbrook became the new county seat. An appropriately impressive courthouse was built, but Holbrook was still known for its brawls and shoot-outs. The newspaper reported that Holbrook “had the distinction of being the only county seat in the U.S. without a church.” A common meeting place, the Bucket of Blood Saloon, had proprietors with anti-church sentiments, and some thought they even inﬂuenced the cowboys against religion. Local attorney Sidney Sapp begum raising money for a Methodist church in 1912. When asking for donations, he explained that he wanted it “so families [could] be induced to come here and make their homes.” The response was, “Who wants to bring women and children here? This is a man’s country.” When Sapp replied that his wife wanted to attend church, he was told, “Send her back to Oklahoma if you want her to go to church.” However, a Methodist church was completed in l9l3 and was soon followed by a Mormon church and an Episcopal church, complete with a hall for the Girl’s Friendly Society, a social and service organization. In 1915, Fr. [Marx] became the first resident Catholic priest. He built a small adobe rectory and church, Our Lady of Guadalupe Catholic Church. Holbrook would no longer be served only by itinerant preachers. Holbrook was ready to become civilized. Sheriff Commodore Perry Owens of Holbrook. “Some of Aztec’s Punchers” – referring to men employed by the Aztec Land and Cattle Company. Late 1800s. Father Edward Albouy was appointed to Winslow in 1917 and the parish at Holbrook then became one of its missions, and was serviced from there. Masses were said at this time, in private on week days, but as yet no Sunday Masses. The first baptismal record of the parish is dated Dec. 28, 1923, at which time the parish was served by the first resident Priest, Rev. J.O. Barrette. Holbrook now had a mission of its own, which was at McNary Ariz. Upon the appointment of a resident priest, the original rectory was built, and was used by the fathers until 1951 when the present rectory was built. During the next few years, the parish was serviced by a number of priests, including Rev. F. Dreichmont, in 1927, and Rev. V. Fons, 1928-1929. Fr. Patrick Beaten became pastor and remained here until 1931. In 1930, Br. Beaten, with the manual assistance and the financial assistance of the people of the small railroad town of Adamana, erected there the Mission of the Little Flower, and this became one of the mission of Holbrook. The linens for the chapel were donated by the Sisters of St. Mary’s hospital in Gallup, and a set of vestments by the Late Archbishop Schrems of Cleveland, Ohio. On April 15, 1931 the first two baptisms took place in this chapel, and the same day the first convert to the religion received his First Communion. In May of that year there was a Communion Class of seven children. Rev. Louis Fernandez became the pastor of Holbrook in 1931 and remained to work in the parish until 1934, when he was succeeded by Fr. A. Castellano, who served until 1939. Rev. E. Roure then took over the pastorate of the parish until Aug of 1942, when Rev. Clement Hageman became pastor. It was am this time that the parish now belonged to the newly erected diocese of Gallup, New Mexico. Before this time it had belonged to the Tucson diocese. A view of a street in Holbrook. As the parish grew, so did the responsibility for missions. In the 1940s, Adamana, Manila and Cold Water were made missions, as was Snowflake. The Adamana mission grew sufficiently that in 1930, Father Patrick Beaton undertook building a chapel. In this endeavor, he had the willing physical and financial assistance of the people of Adamana. The chapel was dedicated to the Little Flower. At present, there are no missions. In 1948 and 1949, the church in Holbrook underwent a general remodeling, including enlargement, and in 1953, a convent was constructed for the sisters. Father Clement Hageman was transferred to Kingman Arizona in January of 1953, and Rev. Anthony J. Schwartz took his place. In February of that year, the Holy Name Society and the C.Y.O was orgainized in the parish. April of 1953 saw another expansion in the parish, namely the erection of a home to house the Catechist Sisters. The work on the home, for the most part was the donation and labors of the men of the parish. In September of 1953 the Catechist sisters took up residence in Holbrook, the first time that resident sisters were in the parish. Since that time, these sisters have taught the children, and helped with the teaching of religion to the children in the missions. The first year they were servicing the Children in Manila, a number of four children. Navajo children are instructed by sisters at Holbrook and Snowflake. In September of 1954, the teaching of the children in Manilla had to be discontinued, because the Government had sent to Holbrook 87 Catholic children, who had to be taught their religion. During the time that the sisters had been here, Mass was said on Saturday morning in Snowflake Arizona, and after the mass, Catechism was taught to the children, by the pastor and the sisters. The mission at Snowflake is a railroad town, and for a chapel has a small 9×12 ft chapel, in which the Mass is said. Catechism is taught in the home of one of the families. In the 1950s, the need for a parish hall became apparent, but the need for a new church became more urgent. So in 1968, a new church was constructed and again dedicated to Our Lady of Guadalupe on December 12, 1968. The old church was remodeled to serve as a parish hall.